Back in December, software maker Autodesk announced that they were shutting down all of their "123D" series of apps, effective sometime in early 2017. It looks like that day is rapidly approaching. In their shutdown announcement, Autodesk promised that they were "consolidating these tools and features into key apps such as Tinkercad, Fusion 360, and ReMake." However, the future is anything but clear for users of the 123D apps suite. What Were the 123D Tools? 123D Design, a desktop and iOS (iPad-only) app that allowed direct manipulation of 2D and 3D shapes with a focus on creating parts with precise measurements. 123D Sculpt+, a desktop app that allowed direct manipulation of 3D shapes as though modeling with clay. 123D Make, a desktop app that enabled users to "slice" existing 3D models into flat 2D designs for manufacturing on CNC machines or laser cutters. Once made, the slices can be stacked to arrive back at an approximation of the original 3D design. However, these apps were not the entirety of the ecosystem. 123dapps.com was also a social site with sharing and collaboration features. Users could store their designs on the 123D "cloud", encourage others to remix them, import others' designs into their tools for remixing, etc. However, one important feature was also available in almost all of these tools: the 123D tools allowed users to save and load files from their local computer and share them on any platform they liked, or not share them at all. What are the New Tools? Tinkercad - A manipulation modeler similar to, but missing some features of 123D Design. Rather than being a desktop app, it runs in modern web browsers. Tinkercad is widely used in education. Fusion 360 - A desktop modeling app that is similar to 123D Design, but which offers much more powerful operations, allowing for more complex designs. ReMake - A desktop app for Windows which can create and clean up 3D models from photos. It's similar to 123D Catch, but also works with many hardware 3D scanners. Indeed, on the surface these seem to cover all the use cases of the 123Dapp.com tools, and in most cases provide superior features. However, there are some wrinkles. Tinkercad is indeed free to use, but it requires users to create a cloud account and to store and share their model via the Tinkercad service. If the Tinkercad servers are down, users cannot access their files or perform any modeling. Oh, and before it was purchased by Autodesk, Tinkercad was almost shutdown entirely. Fusion 360 offers multiple versions, a free trial and a pay edition which is free for users who can prove that they are students. However, even if one pays for the full version, Fusion 360 has one amazing anti-feature: it does not support working with local files. This means that even if a user is a paying customer, they must have fast internet access, a valid Autodesk cloud account, and abide by Autodesk's terms of service for any designs they wish to store or share. Even for users who are happy storing their files in the cloud, Autodesk has made it clear that users are responsible for saving their data or migrating it to the new system before the shutdown. Autodesk's shutdown of the 123D apps suite serves as an object lesson in the dangers of trusting "the cloud", but the lessons go beyond that. The comments section of the shutdown announcement is filled with examples of educators of all stripes who are losing access to education tools. Where it is possible to migrate to the new offerings, curricula must still be rewritten. Given the nature of many school IT systems and student privacy requirements, I am willing to bet that many schools will not be able to replace 123D Design with Fusion 360 or Tinkercad at all. The shutdown extends beyond the cloud to downloadable apps like 123D Design, as well. While Autodesk will not explicitly cripple any of the 123D tools that don't rely on cloud infrastructure, they will not offer future support or patches, and downloading them will soon become impossible. As of this writing, the Windows version of 123D Design can still be downloaded from their site. However, MacOS and iOS versions have already been pulled from Apple's app stores. Unless Autodesk commits to maintaining support for 123D Design's files in their future offerings, users will become entirely unable to work with them. Autodesk provides powerful design tools that can be used by anyone from students with no budget up through professional engineering firms working on multi-million dollar projects. However, all Autodesk users should carefully examine the reasons for and the knock-on effects from this "consolidation". 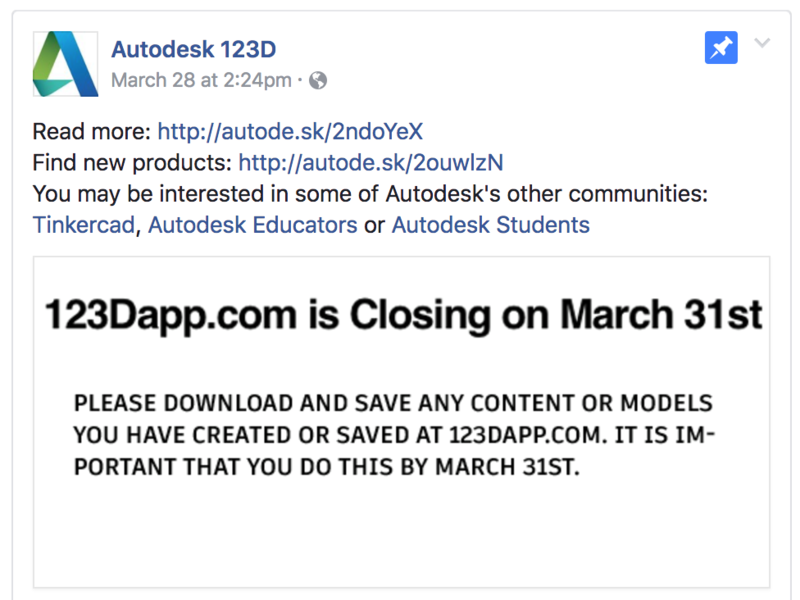 The shutdown of Autodesk 123D should make it clear that Autodesk is herding its users into a silo which will tie the fate of user's designs to the fate of Autodesk's ability and desire to run their cloud platform. Autodesk has shown their willingness to alter the deal they make with their users. Pray they do not alter it further.